Picture Soundtrack with music by Marcelo Zarvos. 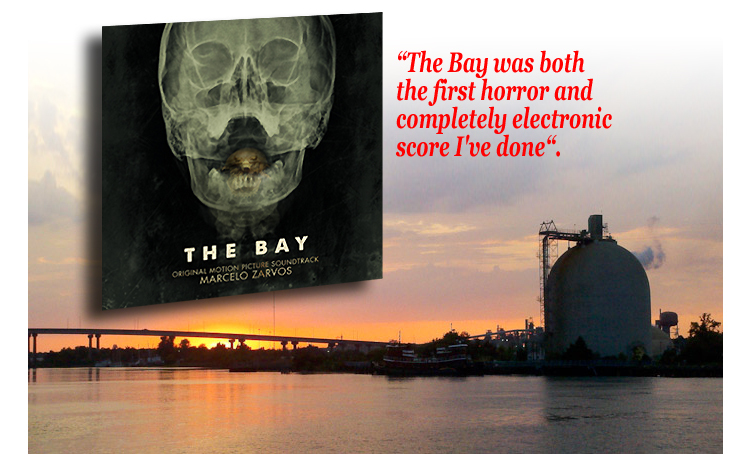 The Bay is a ‘found footage’ eco-horror film from Oscar winning director, Barry Levinson. doing a score top to bottom this way was fascinating and challenging. with his scores featured in films such as Kissing Jessica Stein and The Door In The Floor. has been nominated for two Primetime Emmy Awards (for You Don't Know Jack and Taking Chance). Daniel Barnz’s Won't Back Down, David Mamet’s Phil Spector and HBO series The Big C.
About The Bay: A nerve-shredding tale of a small town plunged into absolute terror. The authorities believed they had buried the truth about the tragedy that claimed over 700 lives. an unimaginable killer: a mysterious parasitic outbreak. could be used to document the nightmare in Claridge. Download the score from Amazon.com and iTunes.